Amazon for the first time disclosed average worker pay, as part of a report mandated by federal Wall Street reform legislation passed after the 2008 financial crisis. 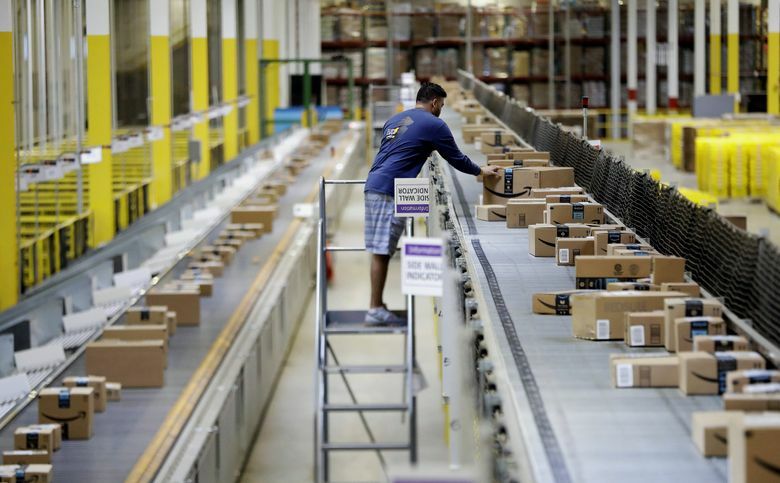 Amazon says its median employee pay was $28,446 last year. That data, disclosed Wednesday in Amazon’s annual proxy report, is a reminder that while the technologists, business managers and marketers at Amazon headquarters can make more than $100,000, in most of the country, Amazon is a blue-collar logistics company where workers take home far less. In Seattle, Amazon’s more than 45,000 employees are paid an average of more than $110,000, according to an analysis of individual worker data posted to job review site Glassdoor. The median, or midpoint, of Amazon’s 566,000 individual employee salaries worldwide stood far lower. At Amazon’s dozens of logistics depots around the U.S., entry-level work generally starts at between $11 and $16 an hour, according to Amazon job postings and Glassdoor reviews. Amazon Chief Executive Jeff Bezos received $1,681,840 in compensation in 2017, the proxy statement said, $1.6 million of which represents the cost of providing his security. Bezos — who owns 16 percent of the company’s shares, a stake that makes him the world’s richest man with a net worth of $127 billion, according to Bloomberg — received the other $81,840 as salary. The pay disclosure was mandated by the federal Wall Street reform bill passed after the 2008 financial crisis. Its aim is to allow a comparison of the top executive’s pay to rank-and-file pay. By that metric, Amazon’s disparity between CEO and average worker pay stood at 59-to-1, a relatively narrow gap. Compensation data firm Equilar, which surveyed companies earlier this year on the pay ratio they planned to disclose, found a median pay ratio of 140-to-1. The pay data includes full-time and temporary workers, though Amazon says the vast majority of its employees are full-time. For part-time employees and those who didn’t work the entire year, Amazon annualized their pay for inclusion in the data. More than 300,000 of Amazon’s employees work in the U.S.